Caution - Spring Hill Road is in very poor condition at present. Be prepared for a rough ride !! This is a very short ride, so is appropriate for novice riders. But it does contain a few quite substantial climbs. They are not enormous, brutal climbs, but they are more than rollers. The ride begins at Walnut Park in downtown, old town Petaluma. The older residential sections of Petaluma are among the nicest in the region for their collection of handsome houses in Victorian and Arts & Crafts styles. Many have been beautifully restored. As this loop is so short, riders might consider adding a mile or two by cruising up and down, back and forth, along the neighborhood streets to the west and north of Walnut Park. There are also several blocks of recently renovated waterfront properties to the east of the park, across Petaluma Boulevard. This area is also worth a meandering visit. We begin by heading into the heart of downtown on city streets, then turning left and heading for the exit on Western Avenue. As it leaves town, Western climbs gently into a more suburban and then rural residential belt on the city’s fringe. Notice the many long, low, barn-like structures in this area: hen houses. Petaluma was once the center of a great egg and poultry producing region. The town used to bill itself as Egg Basket to the World, and they still celebrate their heritage with an annual Butter and Egg Festival and Parade. (The “butter” part salutes the many dairies surrounding the town.) Although those glory days are gone, with many of the old coops converted to artist’s studios or storage sheds, there are still quite a few functioning poultry operations in the area, cranking out not only chickens and their eggs, but also ducks and turkeys and gourmet game birds. Western turns into Spring Hill Road as it finally leaves all trace of town behind. Spring Hill presents riders with the biggest climbing challenge of the day: an ascent of two or three hundred feet in about a mile. Although there will be many other climbs later on, this is the toughest one. Once over the top, the road descends in lazy stairsteps for several miles. Before it ends, Spring Hill will offer up at least two more climbs big enough to put most people down into their little chain rings. Once out of Petaluma, the scenery consists almost entirely of wide open spaces: long, low, rolling hills clothed mainly in waving grasses, but with stands of eucalyptus and bay and oak here and there. Dairies predominate, along with those few remaining poultry operations. In a few spots, the vistas from atop this ridge are quite expansive and grand. At around mile 9, Spring Hill ends in the village of Two Rock (so named for two large rocks standing clear on the ridgeline, which supposedly served as monumental trail markers for native Americans down the centuries). 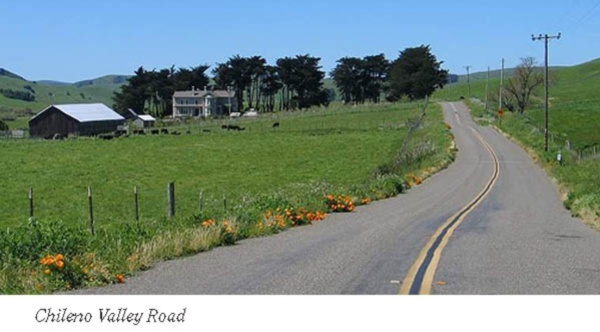 Two quick lefts in Two Rock and the routes heads west on Tomales-Petaluma Road, a long, straight, nearly level run past a sprawling US Coast Guard training station. (No, this does not mean the coast is nearby; the facility is miles from the ocean.) Two miles on this rather ordinary road bring the riders to a left onto Chileno Valley Road, which is not at all an ordinary road. Chileno Valley rolls and dips and curls all the way back to the outskirts of Petaluma. It is occasionally level but more frequently is climbing or descending over gently rolling terrain. This is all dairy country: open grasslands, with oak and bay in the draws. There are also numerous, free-standing, round hilltops lumped around the broad meadows, each covered on top with a thatch of oak forest, sometimes capping a hill like a rather ragged and ill-fitting toupée. In the winter and spring, these wide, sprawling meadows are as green as Ireland, but by late May or early June, the lack of rain has bleached the grasses to a golden hue, and they will remain that way until the rains return in November. Halfway along its journey, the road passes Laguna Lake (impounding the waters of Chileno Creek), home to a wide variety of water birds, including, frequently, a flock of wild white swans. Our route departs Chileno Valley just before it rejoins Western Ave on the edge of town. Rather than retrace that section of city streets, we are going to sneak back into town on a nice bike path that climbs over a ridge before descending back to town. Turn right off the road into the driveway to Helen Putnam Park and follow straight on through the parking lot, past the rest rooms, and out onto the grassy hillside. 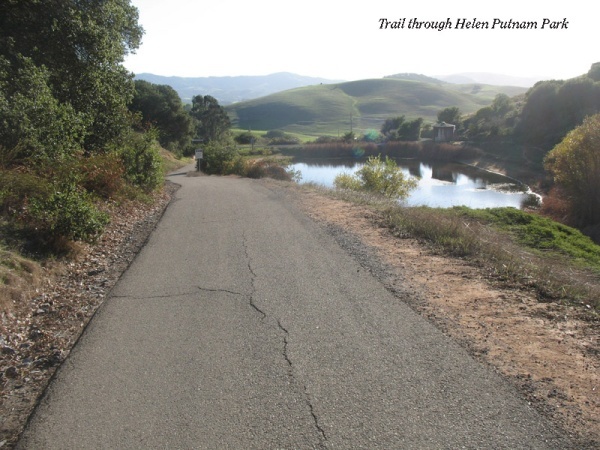 The path climbs quite steeply to a small pond, then a bit more, to a point where it crests the ridge and a splendid vista opens up, showing all of the city of Petaluma along the banks of the Petaluma River. Be a little wary of the descent to town: it is often quite steep, with occasional sharp bends, and being a path and not a road, is quite narrow. The path dumps out into a new, rather posh neighborhood on the west edge of town. Work downhill through the neighborhood streets and turn left on D Street, which leads down into the heart of Petaluma. D Street is the town’s most famous address for stately, historic homes. As you roll slowly downhill on D, your head will be revolving like an owl’s while you try to take in the grand old mansions on both sides of the street for several glorious blocks. D Street leads directly to the finish at Walnut Park.